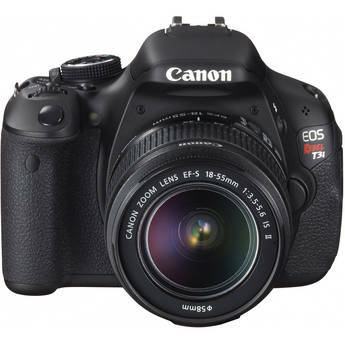 B&H Photo-Video offers the Canon EOS Rebel T3i 18-Megapixel Digital SLR Camera with the Canon EF-S 18-55mm f/3.5-5.6 IS Lens, model no. 5169B003, bundled with the Canon EF-S 55-250mm f4-5.6 IS Telephoto Lens, model no. 2044B002, Canon PIXMA Pro9000 Mark II Photo Inkjet Printer, model no. 3295B002, Canon Photo Paper Plus 13" x 19" Semi-Gloss, SanDisk 16GB Extreme Class 10 UHS-1 SDHC Card, model no. SDSDRX3-016G-A21, and Lowepro Rezo 170 AW Shoulder Bag for $999. This $400 mail-in rebate drops the price to $599 with free shipping. The Rebel T3i features include a 3" vari-angle LCD, 1080p video recording, 3.7 fps continuous shooting, mini HDMI output, SD/SDHC/MMC card slot, USB connectivity, and more. The printer supports photo papers up to 13"x19", and features 4800x2400 resolution, PictBridge4, USB 2.0 connectivity, and more. Rebate ends December 31.